Some of the top hiking destinations during the summer months are the many waterfalls hikes near Bozeman. In the winter, however, these waterfalls freeze but form beautiful sculptures of ice. Accessing these waterfalls can be more challenging during the winter, so we've put together a list of waterfalls that are a little easier to check out on your visit to Bozeman. Located in Hyalite Canyon, Grotto Falls is accessible from they Hyalite Creek trailhead. To get there, head up to Hyalite Reservoir and continue around the dam. Keep going to where the road splits, and stay right. This will take you right to the trailhead parking lot. Use caution when heading up to Hyalite in the winter. The road is intermittently plowed and can get very icy. Four-wheel drive is highly recommended. The hike to Grotto Falls is pretty mellow and around 2.5 miles long. As you are hiking, be sure to look at the surrounding cliffs where you will see even more waterfalls and ice climbers making their way up the frozen ice. Palisade Falls is one of the most popular hikes in Hyalite during the summer, but it is a little more difficult to get to during the winter. The road to the Palisade Falls Trailhead is closed during the winter so you will have to park at the gate where the road past Hyalite Reservoir splits and hike the two miles to get to the Palisade Falls trailhead. Head past the reservoir like you are going to Grotto Falls, but stay left when the road splits. You will find a parking lot near the gate to leave your vehicle. Again, the hike is pretty mellow without much elevation gain. Snowshoes are recommended to keep stable footing, but the road and the trail up to Palisade Falls should be packed down. This is a popular destination for ice climbers so you might get to watch a few as you sit and admire the scenery. Ousel Falls is actually located south of Bozeman in Big Sky but is, by far, the easiest of the three to get to. It is near the Big Sky Town Center along a well-maintained trail system with beautifully designed timber frame bridges. The trail gets quite a bit of traffic but be sure to wear boots with some heavy traction. There are some gradual slopes that you will travel, both up and down, so you don't want to lose your footing and slip. To get to Ousel Falls, travel to Big Sky and turn left onto Ousel Falls Road at the stop light in Big Sky Town Center. Travel about a mile and a half to find a parking lot along the left side of the road. The waterfall itself is very broad, compared to the other two, and forms a large wall of ice during the winter. There are multiple locations to observe the falls once you get to it. You can even hike right down to the base falls if the ice is thick enough. There are numerous frozen waterfalls around Bozeman during the winter. 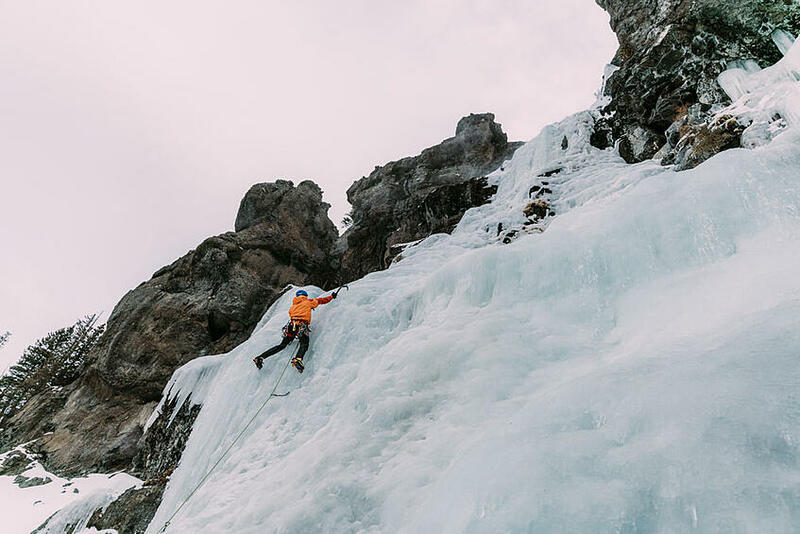 In fact, Hyalite Canyon is ranked in the top ten in the world for ice climbing destinations; however many are difficult to get to. We hope you take a little time to check out one of these frozen waterfalls on your visit to Bozeman.